you’d see how similar those 1930s letterforms are to the ones on this logo. “SPIDER MAN” is condensed, compressed horizontally, but is otherwise much the same. The most interesting new addition is the spiderweb behind the letters, following the same arc. It’s faint and broken up in places, and kind of fades away at the bottom and right. 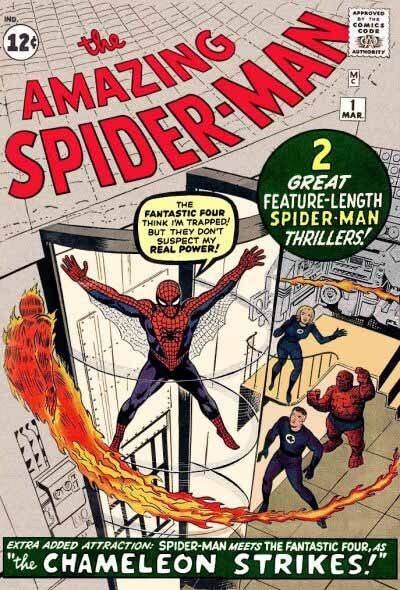 Perhaps it was an afterthought added to the cover art by artist Steve Ditko or staffer Sol Brodsky. The essentially triangular shape of the logo is an unusual one for comics of the time. I can’t think of another logo then or since quite the same shape. According to Mark Evanier the original Marvel logos, like this one, were designed by production manager Sol Brodsky and inked by letterer Artie Simek. Mark got this information from Sol, and corroborated it with what Stan Lee could remember on the subject (probably not much), so I think it’s likely to be accurate. The style is similar to interior titles Simek lettered on many early Marvel stories. Brodsky must have immediately begun to second-guess his design when putting together the first cover. He had nowhere to put the Comics Code Seal except over the N, which doesn’t look very good. I suspect that’s why the logo changed for the second and following issues, and this particular version wasn’t seen again. With issue two we arrive at what will be the essential Spider-Man logo for many years. The words are the same, but re-angled and rearranged, with “the” now left of “AMAZING”, and both surprisingly far away from “SPIDER-MAN”. The gap does highlight the attractive new webbing in the background, though, which is much more complex than on issue 1, with three obvious web centers in the open areas and at least one, perhaps two hidden behind the letters of SPIDER-MAN. I would guess whoever did that looked at either pictures or real spiderwebs, as they’re more realistic than issue 1, and add a unique touch to the logo. One potential problem would be if the cover art continued up to the top of the page, but that’s been avoided here, and I think usually was for some time. The other thing that’s new is the trade dress box at upper left with Spidey’s head and the Marvel name and price, an early marketing idea that as a kid I really liked. Marvel books soon all had them, and it was helpful on picking up a new title to quickly identify who the hero was. It also fed the collector mentality — I wanted all the comics with that box! 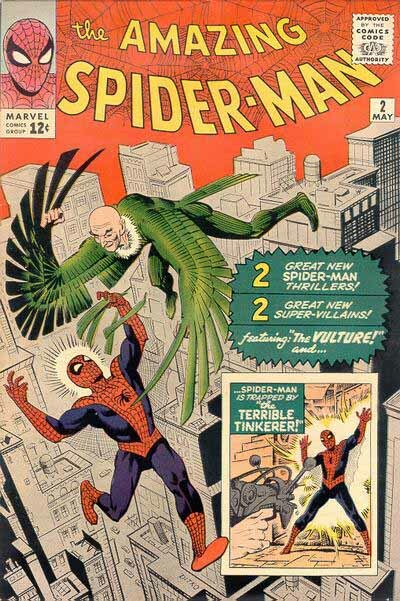 While I didn’t actually see any issues of AMAZING SPIDER-MAN until issue 11, once I got hooked on Marvel, it quickly surpassed my old favorite, DC Comics, in my comics buying. Lots of other kids felt the same way, I think. The addition of the box has crowded the logo area some, and the code seal is still over the N a bit, but not in as obtrusive a way as on issue 1. And the entire upper quarter of the book looks much more balanced, with the corner box offset by the code seal and issue/date boxes on the other side. 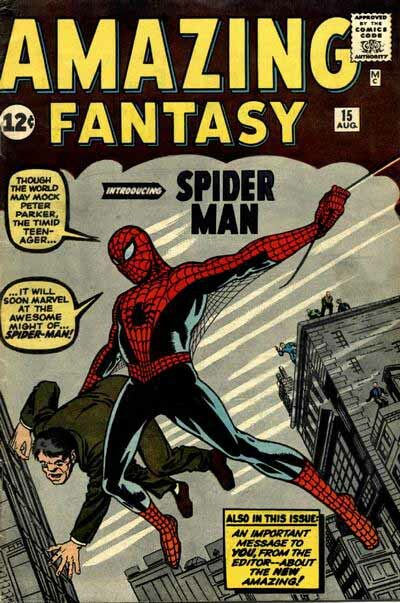 With issue 7 the final element of the long-running logo was added, the open drop-shadow behind SPIDER-MAN. The color scheme of this cover shows perfectly why this was a good idea, as it allowed a second color in the logo to give it impact and dimensionality. 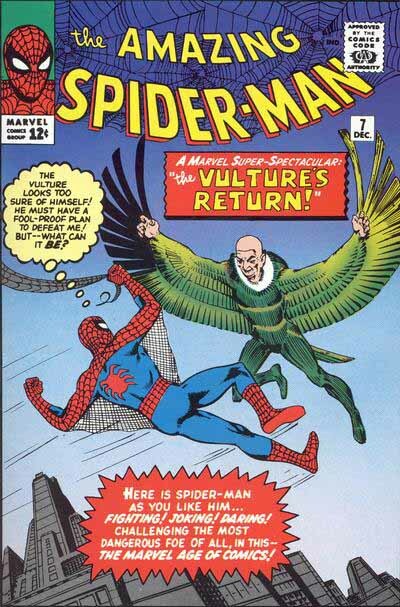 The character’s popularity and quick rise to the top were fueled by the scripts of Stan Lee and the wonderful stylized art of Steve Ditko, but I like to think the attractive webbed logo helped a bit, too. In the 1960s Marvel’s ability to add new titles to their comics line was limited by restrictions set by their distributor. They did try one other avenue for the character, though, this very short-lived magazine-sized book from 1968 that could be displayed in a different part of newsstand racks, away from the comics, thus avoiding the distributor restrictions. Unfortunately the buying market was not yet there for such a product, and I believe this second issue was the last. The logo uses the same SPIDER-MAN, with THE SPECTACULAR in the same style, but smaller. Doesn’t work quite as well for me, and the cover art behind the logo meant the webbing wasn’t used. 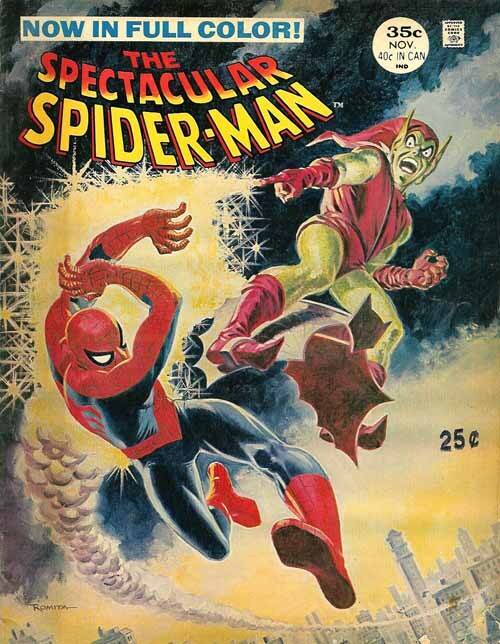 Still, an interesting experiment, an unusual painted cover from John Romita, and the first use of the adjective “Spectacular”. That had to be Stan Lee’s idea, a great bit of bombastic alliteration! More next time as we move into the 1970s. This entry was posted in Logo Studies on February 29, 2008 by Todd.